Steve Evans and Paul Bastock (left) celebrate Boston United's promotion to the Football League. Multiple promotion-winning Football League manager Steve Evans has lauded the record-breaking achievement of ‘fantastic’ local goalkeeper Paul Bastock. Wisbech Town number one Bastock will break England and Nottingham Forest legend Peter Shilton’s world record for competitive club appearances in tomorrow’s FA Vase tie at Thetford (November 11). The 47 year-old equalled Shilton’s record of 1,249 matches in a United Counties Premier Division win at Sleaford on Wednesday. Evans, who is now in charge of League Two side Mansfield, was the manager and Bastock the goalkeeper when Boston United won promotion to the Football League in 2002. “Paul was a fantastic keeper for Boston and a fantastic professional,” Evans stated. “He should be very proud of what he is about to achieve. “Sir Alex Ferguson didn’t have time for theories on goalkeepers, he just said pick the one who keeps the ball out of the net the most! Bastock is the club record appearance holder at Boston with 678. He has also represented 16 other clubs in a Football League career that started under legendary Posh boss Chris Turner at Cambridge United. Bastock also won the 1987 FA Youth Cup with Coventry City when he defied Southampton’s star players Alan Shearer and Matt Le Tissier in a quarter-final win. Wisbech haven’t lost for 13 matches under new manager Gary Setchell before last night. Bastock had kept four clean sheets in a row before Wednesday’s 2-1 win. Yaxley will have former Posh youngster Andy Furnell in charge of tonight’s FA Vase derby at Yaxley at In2itive Park (November 10, 7.45pm) following the resignation of manager Brett Whaley. Also involved in FA Vase action tomorrow are Deeping (away to Godmanchester), Holbeach (away to Walsall Wood) and Wisbech St Mary (home to Norwich CBS). Stamford AFC put their season-long unbeaten home record on the line when hosting Droylsden in the FA Trophy at the Zeeco Stadium on Saturday. Peterborough Sports travel to fellow strugglers Evo Stik League Division One South Belper tomorrow, when Spalding United, who announced some cuts to their playing budget this week, travelling to unbeaten leaders Basford United. 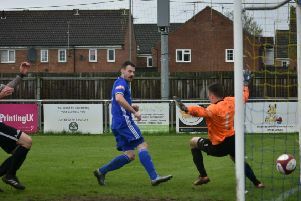 Pinchbeck United could return to the top of United Counties Division One with a win over Burton Park Wanderers at Knight Street. Second Round: Yaxley v Peterborough Northern Star (7.45pm). Second Qualifying Round: Stamford v Droylsden. Second Round: Godmanchester Rovers v Deeping Rangers, Thetford Town v Wisbech Town, Walsall Wood v Holbeach United, Wisbech St Mary v Norwich CBS. Division One South: Belper Town v Peterborough Sports, Basford United v Spalding Utd. Division One: Blackstones v Long Buckby, Bourne Town v Lutterworth Athletic, Huntingdon Town v Stewarts & Lloyds, Pinchbeck United v Burton Park Wanderers.